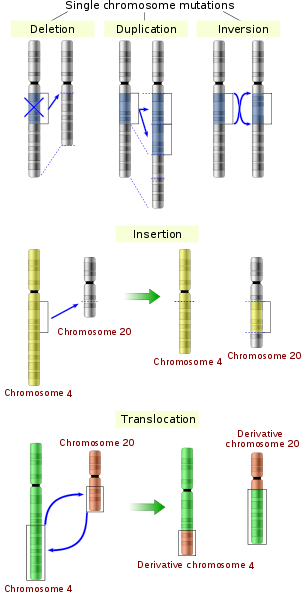 ^ "mutation | Learn Science at Scitable". www.nature.com. Retrieved 2018-09-24. ^ Gregory TR, Hebert PD (April 1999). "The modulation of DNA content: proximate causes and ultimate consequences". Genome Research. 9 (4): 317–24. doi:10.1101/gr.9.4.317 (inactive 2019-03-11). PMID 10207154. ^ Tibayrenc, Michel (2017-01-12). Genetics and Evolution of Infectious Diseases. Elsevier. ISBN 9780128001530. ^ Hull, D. L. (1985). "Darwinism as an historical entity: A historiographic proposal". In Kohn, D. The Darwinian Heritage. Princeton University Press. pp. 773–812. ^ Futuyma, Douglas J. (2015). Serrelli, E.; Gontier, N., eds. Can Modern Evolutionary Theory Explain Macroevolution? (PDF). Macroevolution. Springer. pp. 29–85. ^ Steenhuysen, Julie (2017-12-19). "U.S. Lifts Funding Ban on Studies That Enhance Dangerous Germs". U.S. News & World Report. Retrieved 2018-01-15. ^ Paz-Priel I, Friedman A (2011). "C/EBPα dysregulation in AML and ALL". Critical Reviews in Oncogenesis. 16 (1–2): 93–102. doi:10.1615/critrevoncog.v16.i1-2.90. PMC 3243939. PMID 22150310. (Subscription required (help)). ^ Hogan, C. Michael (12 October 2010). "Mutation". In Monosson, Emily. Encyclopedia of Earth. Washington, D.C.: Environmental Information Coalition, National Council for Science and the Environment. OCLC 72808636. Archived from the original on 14 November 2015. Retrieved 8 October 2015. ^ "RB1 Genetics". Daisy's Eye Cancer Fund. Oxford, UK. Archived from the original on 2011-11-26. Retrieved 2015-10-09. ^ a b Chadov BF, Fedorova NB, Chadova EV (2015-07-01). "Conditional mutations in Drosophila melanogaster: On the occasion of the 150th anniversary of G. Mendel's report in Brünn". Mutation Research/Reviews in Mutation Research. 765: 40–55. doi:10.1016/j.mrrev.2015.06.001. PMID 26281767. ^ Doniger SW, Kim HS, Swain D, Corcuera D, Williams M, Yang SP, Fay JC (August 2008). Pritchard JK, ed. "A catalog of neutral and deleterious polymorphism in yeast". PLoS Genetics. 4 (8): e1000183. doi:10.1371/journal.pgen.1000183. PMC 2515631. PMID 18769710. Jones, Steve; Woolfson, Adrian; Partridge, Linda (December 6, 2007). "Genetic Mutation". In Our Time. BBC Radio 4. Retrieved 2015-10-18. Liou, Stephanie (February 5, 2011). "All About Mutations". HOPES. Huntington's Disease Outreach Project for Education at Stanford. Retrieved 2015-10-18. "Locus Specific Mutation Databases". Leiden, the Netherlands: Leiden University Medical Center. Retrieved 2015-10-18. "Welcome to the Mutalyzer website". Leiden, the Netherlands: Leiden University Medical Center. Retrieved 2015-10-18. — The Mutalyzer website. This page was last edited on 17 April 2019, at 14:33 (UTC).